Welcome back to a week of stencils, Monday I shared a card where I sponged through the metal stencil. My card today uses two metal stencils from Stampendous, one was sprayed and the other paste embossed. Here is how it was made. 1. Place the Diamond Grid Stencil on a white panel and spray with Crushed Olive Distress Spray and let dry. 2. Place the Dragonfly Swirl Stencil on top of the dried piece and used removable tape to tape it in place and insure it doesn't slip. 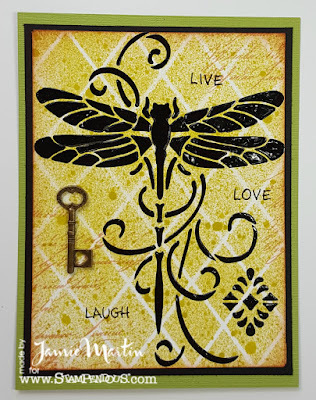 Then paste emboss through the stencil with Glossy Black Embossing Paste using a Palette Knife. Carefully remove the stencil and place in warm soapy water and lightly scrub with a fingernail brush. Set embossed piece aside to dry. 3. Once dry, randomly stamp script lines with Tea Dye ink and sponge edges. 4. Stamp the words Live, Love and Laugh as shown with black ink. 5. Glue a key charm under the left wing with Zip Dry Glue. 6. Layer onto a larger black panel and glue to a green card.